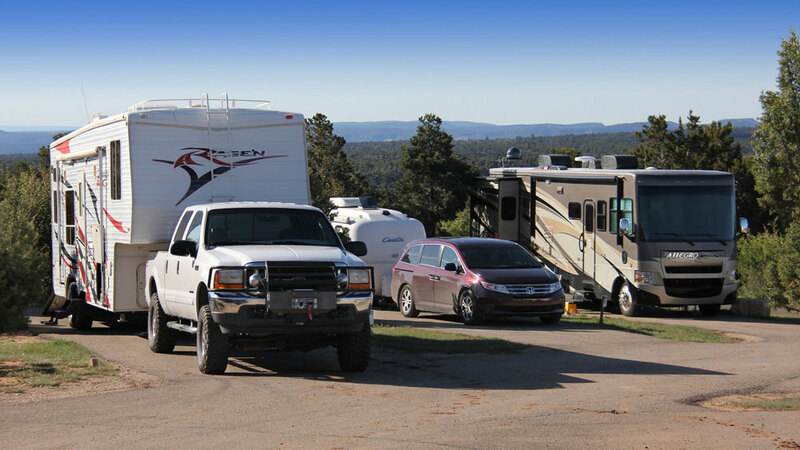 Zion Ponderosa Ranch Resort has some of the closest full hook-up RV camping to the East Entrance of Zion National Park. The resort is but a small piece of the beautiful Ponderosa Property. Explore the thousands of acres that are framed by a vast forest and an almost reachable sky. This is truly a well kept treasure for southwestern Utah. Away from the hustle and bustle of city life and city lights, you see only the stars at night and it is close to Utah’s National Parks. You will be nestled among the Pinion Pines and Utah Junipers with Zion National Park painting an outstanding background for any sunset or vacation. Sit back and watch the mule deer and wild turkey meander into your RV site. Rates/Availability: There is a base price for the first two people. Rates vary based on season. Use Reservation Search Tool or Book Now button to view rates and availability. Rates for up to 4 people. $12.00 for each addl. person (above 4). Arrivals via Zion Tunnel – Important Note: There are vehicle size restrictions inside the tunnel at Zion National Park. After 8:00 pm. (During Summer Months)- the Zion Tunnel is closed to over-sized vehicles that need two lanes to get through the tunnel. If your vehicle is small enough to fit in one lane, you can go through, otherwise it may be best to travel around the park from Hurricane to Kanab, to Mt. Carmel and to the North Fork road. (Please visit this Zion National Park Tunnel Information link). You may call us directly for additional details. MINIMUM TWO NIGHT STAY REQUIRED on all vacation homes and for all other lodging types during peak season, holidays, and Friday stays. Call for one night exceptions and availability – 800-293-5444. Package activities with lodging and save. Lodging discounts available for shoulder season. - Deposit: Deposit - A 50% deposit is due upon booking for all reservations. The remaining 50% is charged 30 days prior to arrival. You will receive another confirmation upon final payment. Reservations for next summer will require a 10% down payment upon booking, another 40% payment in January, and the final payment is due 30 days prior. - Cancellation Policy: Deposit - Cancellations more than 30 days prior to arrival are fully refundable less a 10% administrative fee per reservation. Cancellations made within 30 days of arrival but more than 48 hours prior are 50% refundable. Cancellations made within 48 hours of arrival are non-refundable. - No Pets and No Smoking allowed in all lodging units. Zion Ponderosa Ranch Resort allows service animals in our accommodations and on the resort according to the ADA Requirements as follows: Only dogs are recognized as service animals under titles II and III of the ADA. A service animal is a dog that is individually trained to do work or perform tasks for a person with a disability. Under the ADA, service animals must be harnessed, leashed, or tethered, unless these devices interfere with the service animal’s work or the individual’s disability prevents using these devices. While there is no pet deposit taken, a customer with a disability may be charged for damage caused by himself or his service animal. Emotional support pets are not covered under this policy per Utah law and are considered “pets” and are not covered under this pet policy. Other pets will be considered in other areas and accommodations of the resort. A $100 non-refundable pet cleaning fee will be charged for each pet. Please check with reservations or the front desk to see what pets are allowed and where they are allowed. - Check-In / Late Arrivals: Check-in time is 4:00 p.m. If you or anyone in your party finds that your arrival time will be later than the closing time of our check-in desk, please be aware that there will be a late check-in packet available for you. Please call the Resort if you will be arriving later than 9:00pm." - For Vacation Home Rentals a minimum 2-Night stay is required. All linens are provided, however housekeeping services are only provided after your departure. Guest are responsible for any damage to the home during their stay. We'll help you customize a package to meet your needs. Please give us a call to learn more. 1-800-293-5444. 10% discount available on lodging rates during spring and fall. Additional spring/fall packages...here. - Please note that for the winter period between Thanksgiving and March 15, our regular activities are not available and dining offerings are limited. This is a great time to enjoy the quiet of Zion National Park while staying in one of our cabins or mountain homes. - View our reservations/cancellation policies by clicking here. - View Dining options by clicking here. - View Adventure Recreation options by clicking here.